The European Union’s General Data Protection Regulation (GDPR), which comes into force on May 25, will govern the storage and processing of data rather than its collection. It also includes some very important consumer rights. The most important are the right to be informed, the right of access, the right to correct errors, the right to erase data, the right to restrict processing, and the right take it elsewhere (data portability). How useful these will be in practice remains to be seen. Emails are like plain text postcards because they can, in theory, be read at any of the many servers through which they pass, or by someone tapping a line. Of course, “read by” is unlikely to mean “read by a human being.” However, software can look for things like passwords and credit card numbers. A more likely problem is sending emails to the wrong address, either because users have got their own email addresses wrong (this happens surprisingly often), or through human error. Pick the wrong address from a list of auto-complete suggestions and you could send personal data to the wrong recipient. This would be a data breach that might have to be reported. It would obviously be good thing if all emails were encrypted by default so that only the intended recipient could read them. Three decades of history says this isn’t going to happen soon even though it would help secure investments and asset protection information, if at all. Public key encryption is too hard for people who just want to send normal emails. Some large organisations do have encrypted email services, such as the NHS, but that doesn’t help the rest of us. Some people do choose secure email services, such as ProtonMail in Switzerland and Tutanota in Germany. However, you also have to send external recipients a password – for example, in an SMS text message – to decrypt the email. Tutanota users get an email that says “you have an encrypted email” and you click a link to read it, and reply to it, in a browser. You have to export the email if you want to keep a copy. There are also plug-ins for Gmail and the Microsoft Outlook email program that provide secure email services. If one of your employers is using a secure system, they might let you join in. If there’s no other alternative, you should encrypt and password-protect your images and documents before sending them as email attachments. Again, you must send the password separately, either via a different messaging service or in the post. It’s a good idea to upload attachments and then send people a link. However, bear in mind that you are uploading documents to the company that probably runs the biggest surveillance operation on the planet. Encrypt your documents before you upload them. Encryption protects data if an online storage service is compromised – it has happened – or if your email is hacked. Unfortunately, using Google Drive brings up an extra complication. If you are using Gmail, then you can assume that your data is being held in, or passing through by arizona bus company, or accessible from the USA. GDPR does not oblige users to store data on servers inside the EU. However, there are extra requirements if servers are outside the EU. First, you need to have a legitimate reason for transferring personal data outside the EU. Second, you must have the consent of the person whose data is being exported. Third, you must give that person the option to opt out. In another post, the aforementioned Liz Henderson explains how to create a GDPR Privacy Notice, and you could adapt her sample to cover Gmail storage outside the EU. You could switch to using an email service that operates wholly within the EU (see above), if only for any people who opt out, or you could upgrade to Google’s paid-for service. Google claims that its G Suite and Google Cloud Platform (GCP) services are fully compliant with GDPR, because it offers to sign EU Model Contract Clauses and a Data Processing Amendment. The fine print notes that “the parties acknowledge and agree that Non-European Data Protection Legislation may also apply to the processing of Customer Personal Data” and that “Google will not process Customer Personal Data for Advertising purposes or serve Advertising in the Services”. A new app – Alliop, is revolutionising the way customer loyalty works in Truro. By downloading the free smartphone app, customers can earn ‘stamps’ at outlets, which accumulate to unlock rewards. Customers are encouraged to tap their smartphone on the provided iBeacon, a small battery operated standlone Bluetooth-enabled transmitter, which wirelessly connects with modern smartphones. A quick tap adds points, which accumulate in order to gain rewards as set by the business. By offering rewards in a similar way to the traditional loyalty card, customers are incentivised to continue visiting. Several companies in Truro are now involved with the scheme – Illustrated Living, Mustard & Rye, Plum Boutique and Secret Truro. The hope is to spread take up of the app across Cornwall so visitors and locals can all take advantage. Alliop’s easy-to-use marketing tools allow businesses to send targeted and personalised SMS messages, emails and push-notifications via a comprehensive customer relationship management portal. With each tap businesses can gain greater insight into a variety of areas including frequency of visit and how recently customers have visited. Further to this, customer details such as email address and mobile phone number allow for direct communication to develop engagement further. If you’d like to know more about Alliop,how it works and pricing, get in touch with Microcomms and we can talk you through the technology and help you engage your customers in a loyalty scheme that works for both of you. This is a long-running scam that preys on the hopes of public speakers, inviting them to speak (and be paid a hefty fee) at a conference in the UK or somewhere else in the world. In the last year or so, the scam has taken a nasty turn, targeting ministers, pastors, and preachers to invite them to a bogus religious conference and again offering them a big paycheck. Now, the scam has taken a new direction, aimed at women and parents, or at least speakers on these subjects. Please beware if you get a letter like this. The idea is to get your personal details under the pretext of sending you some money, or getting you to send some money to take care of administrative fees or governmental controls, with a promise of a big check to come. But this is a scam. You will never get the promised big check. The conference is not real. So the answer is simply to ignore the email. Don’t be tempted! Fraudsters are generating phishing emails by posing as HMRC in order to gain access to people’s bank accounts. It appears the occurrence of these emails has become increasingly common as a Which? survey found that of 2016 adults, 40% had received communication of this nature. 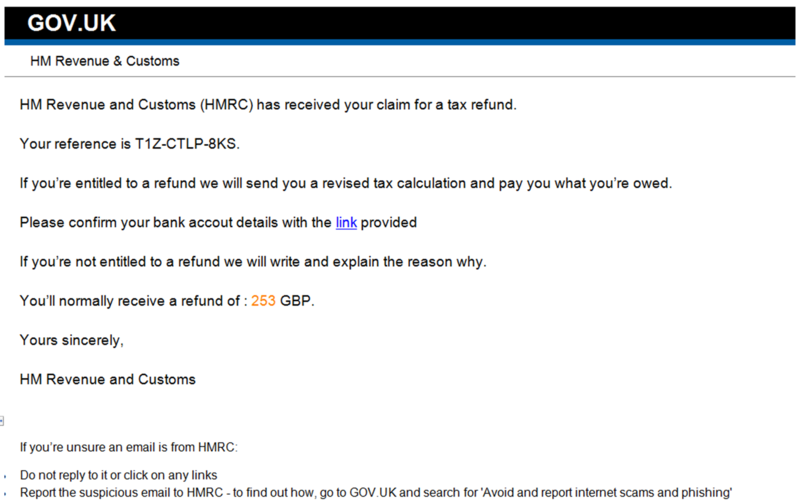 The general format of these e-mails can look very convincing as they make use of genuine HMRC branding. Sometimes emails are signed off with the name of an actual HMRC employee making them seem even more realistic. The contents will generally be offering you a tax refund and asking for bank details in order for the money to be refunded. HMRC will never send notification of a tax reimbursement or ask for personal or payment information by email. So you can safely ignore these emails. This is a sophisticated phishing scam that asks for permission to access files stored in Google Drive. The attack involves an email being received saying a Google Doc has been shared with you. “If you have disclosed confidential data (e.g. a username or password), go to the real site and change it immediately, to stop the criminals hijacking your online account,” You can also report emails to your email service provider. If you see a phishing email at work, the best approach is to forward it to an IT department or report it in via internal company systems. If it appears to come from a colleague, but it does look and feel ‘phishy,’ don’t reply in the mail, call them or go to see them to confirm the validity of the mail and the contents. Never reply to the message, even if you fancy taunting the ‘phisherman,’ you would only be confirming your email address is valid and live. If you do click on a phishing link, it’s also worth reporting the incident to Action Fraud.